Did you figure out our little tease? 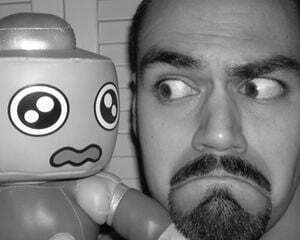 It was indeed a big, glowing eyeball, one of the new features on the latest iteration of the Mr. Destructoid helmet. Once again courtesy of Volpin Props, this piece of high fashion will no doubt be all the rage in hipster bars nationwide... until Niero grows bored of the frivolity and requests another helmet, of course. Probably made of solid gold next time. Photographer Dan Almasy snapped a few photos of the new helmet in action and graciously shared them with us. 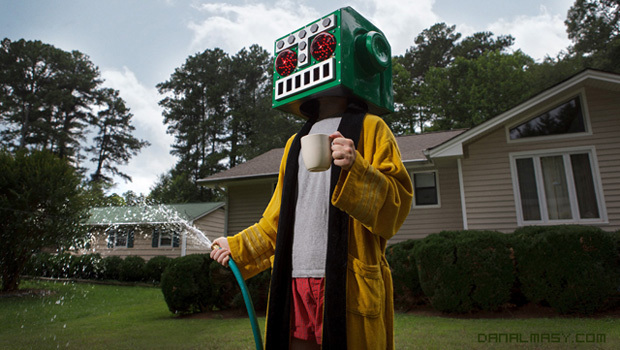 If you are wondering why Mr. Destructoid is watering his yard in the header picture, keep in mind that's not a hose.